Brown planthoppers, stem borers, leafhoppers, moths, flies, and other agricultural pests they can catch. Crab Spiders (Thomisidae) are colorful crab-like spiders generally found on the blossoms of plants. They have the tendency to camouflage in their habitat so as to catch prey, unaware as they pass by. They are called crab spiders because their first four legs are larger than their hind legs and because of their capability to walk forward, backward, or sideways like a crab (CABI, 2000). Dwarf spiders (Atypena formosana) are very small and are always mistaken for spiderlings (newly hatched spiders) of other spider species. They measure about 1 to 5 mm in length. Adults have three pairs of spots or gray markings on the dorsal part of their spherical abdomen. They are normally found in groups at the base of a plant. They build webs and catch their prey by trapping them in their webs. However, they can hunt directly and feed on 4-5 leafhopper/planthopper nymphs a day, and also other small insects (IRRI, 2001). Grass spiders are moderately sized, brownish-gray weavers of funnel-shaped webs. Their webs are not sticky and can often be found on low-growing shrubs (CABI, 2000). Jumping spiders (Phidippus sp. ) are brown jumping spiders with brown hairs covering their body. They have two bulging eyes and these are arranged in three distinct rows. They have broadly or partly ovoid abdomens with light transverse basal bands. They feed on leafhoppers and other small insects (IRRI, 2001). Long-jawed spiders (Tetragnatha maxillosa) have long legs and bodies, measuring 6 to 10 mm in length. Their eyes are arranged in two distinct rows. Their abdomens are brownish-yellow, with or without markings and are usually four or more times longer than their width. They prey on moths and flies and can consume 2 to 3 preys a day. Once their prey are caught, these are wrapped with silk in their webs (IRRI, 2001). Orb weavers, Argiope spiders (Aranaeus spp.) are large yellow-black garden spiders which produce zigzag stitches in the bottom center of large webs hanging between stems of plants. They have poor vision and can locate their preys by the vibrations and tension on their web threads (IRRI, 2001). Wolf spiders (Lycosa pseudoannulata) have forked or Y-shaped median light bands on their outer coverings. Wolf spiders prey on moths and butterflies. They feed on 5 to 15 preys daily and they eat each other when their population is high (IRRI, 2001). Some spiders' eggs are laid in a cluster in silken sacs, while some species lay their egg masses covered with silks within folded leaves. Some of these sacs are attached to the mother spiders or mothers stay nearby to guard their egg sacs. Eggs usually hatch into spiderlings within three weeks. The spiderlings may remain attached to the mother for several days on some species, but for some species they are left on their own. Spiders are not insects. They have 8 legs while insects have 6. They do not have wings whereas insects do. They have two body sections; a united head and thorax and abdomen, while insects have three; head, thorax, and abdomen. A female can produce 200-400 eggs but only 60-80 spiderlings can hatch from these. Females can survive 2-3 months. In some species, females die after laying eggs. All spiders are poisonous to insects but only a few species are poisonous to humans, the Black widow and the Brown recluse (CABI, 2000; IRRI, 2001). Mulching along some sections in dikes of rice paddies, in field corners, or a portion of the fields can increase the number of spiders. They can hide in the layer of mulch that serves as their alternate habitat. They can also prey on other small insects inside the mulch. Remember, that the more food the spiders can eat, the faster their population build-up will become. 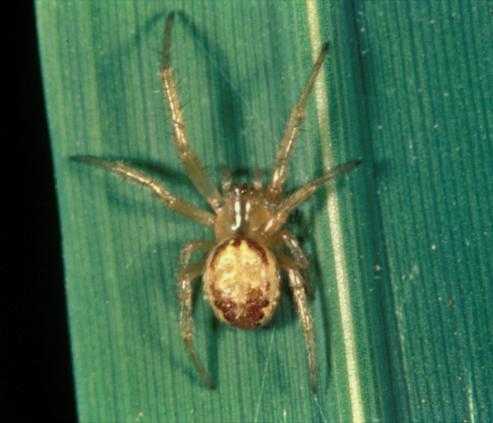 Cover crops are also important to provide over-wintering sites of spiders sacs. A spider population depends on the availability of food, the habitat, and the environmental conditions. Avoid use of pesticides as much as possible, for broad-spectrum insecticides can easily kill them (Reissig; et al., 1986: pp. 119-127).